Office 365's Skype for Business Online is a robust unified communications platform with integrated IM, voice, video, and screen sharing features. Should Skype for Business Online experience downtime or issues, businesses relying on this means of correspondence won't be able to communicate as they usually would. If real-time communication is disrupted, users will stop communicating with each other about regular business processes, and start calling IT admins for assistance. Unfortunately, getting the real-time health and performance status of Skype for Business with the native tools in Office 365's Service Health Dashboard (SHD) is a challenge. Skype for Business Online places high demands on your network, and those demands increase exponentially as more employees use this communication client. Network latency or service incidents could affect scheduled customer calls, meetings, and other business processes that happen via Skype for Business Online. This highlights the importance of keeping constant vigil to identify performance issues and other service incidents in Skype for Business Online as soon as possible, so that alternative forms of communication can be used if needed. You need an Office 365 service health monitoring tool that not only tracks the health and performance of Skype for Business Online, but also notifies you about outages and issues without any lag. O365 Manager Plus monitors Skype for Business Online around the clock for any issues or service outages. Since service outages can be costly, it's important that they're brought to your attention without any delay. This is why O365 Manager Plus sends out instant email alerts upon service outages and incidents. 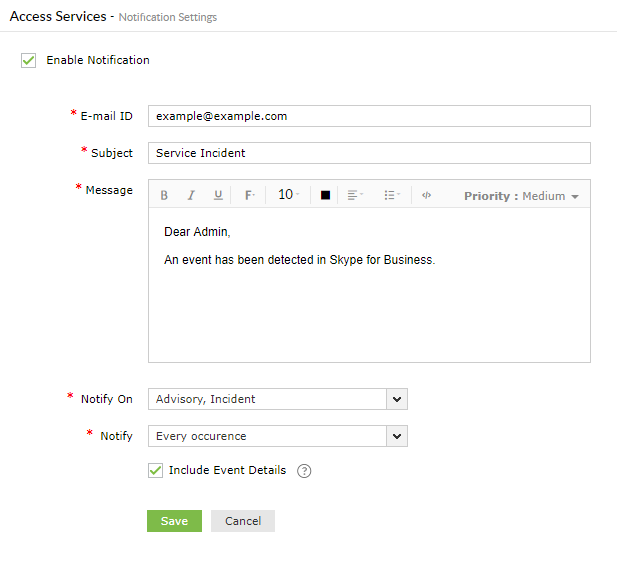 The detailed alert email provides a complete summary of the incident with details on which feature is affected (audio/video, IM, meetings, PSTN calling, dial-in conferencing, etc. ), the number of users affected by the incident, the consequences of the incident, and more. O365 Manager Plus also monitors the endpoints of Skype for Business Online to ensure the availability of the application. 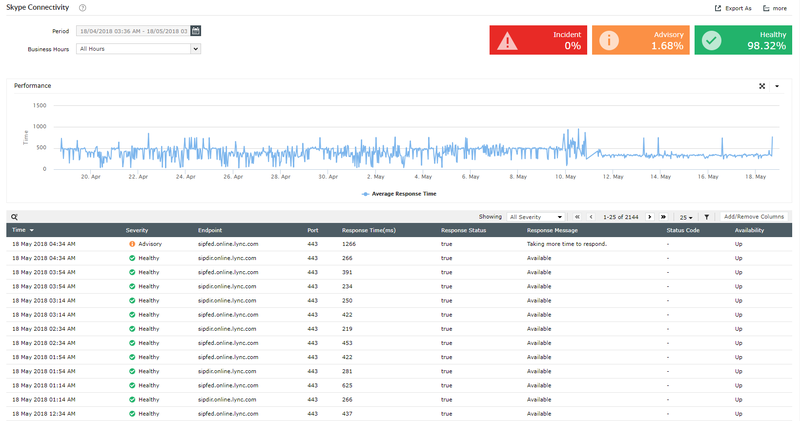 It provides a graphical representation of each endpoint's response time, which helps you understand the performance of Skype for Business Online over time. 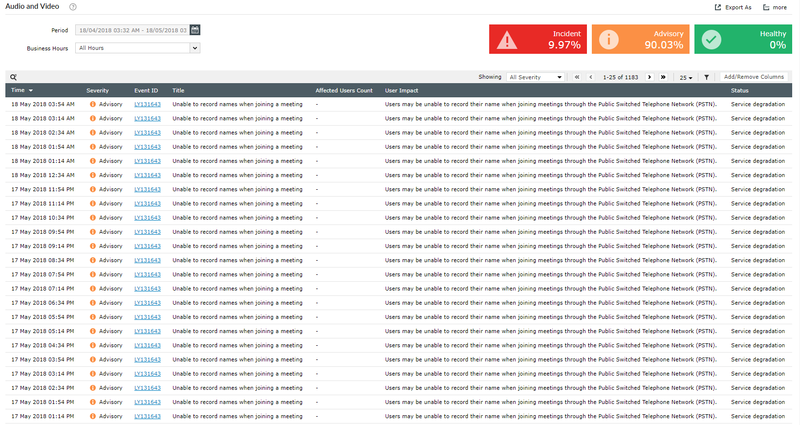 Real-time alerts: Get instant email notifications on service incidents. Historical data: Gain access to historical Office 365 service health monitoring data that's older than 30 days. Best of all, you can view the health status of all services in a single graphical dashboard.